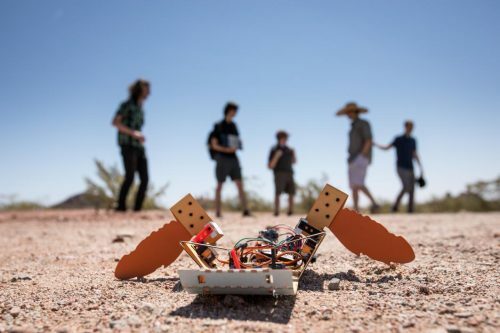 In an effort to create a robot that can teach itself to navigate different terrains, scientists at Arizona State University have built C-Turtle, a Raspberry Pi-powered autonomous cardboard robot with turtle flippers. This is excellent news for people who live in areas with landmines: C-Turtle is a great alternative to current landmine-clearing robots, since it is much cheaper, and much easier to assemble. As any user of Python will tell you*, turtles are amazing. 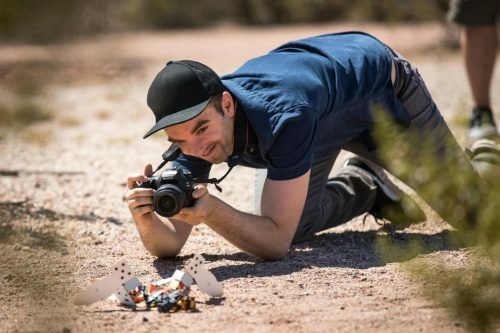 Moreover, as the evolutionary biologist of the C-Turtle team, Andrew Jansen, will tell you, considering their bulk** turtles move very well on land with the help of their flippers. Consequently, the team tried out prototypes with cardboard flippers imitating the shape of turtle flippers. Then they compared their performance to that of prototypes with rectangular or oval ‘flippers’. And 157 million years of evolution*** won out: the robots with turtle flippers were best at moving forward. But the scientists didn’t just slap turtle flippers on their robot and then tell it to move like a turtle! 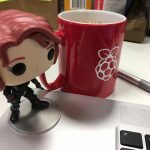 Instead, they implemented machine learning algorithms on the Pi Zero that serves as C-Turtle’s brain, and then simply let the robot do its thing. Left to its own devices, it used the reward and punishment mechanisms of its algorithms to learn the most optimal way of propelling itself forward. And lo and behold, C-Turtle taught itself to move just like a live turtle does! This is “Robotic C-Turtle” by ASU Now on Vimeo, the home for high quality videos and the people who love them. Robots currently used to clear landmines are very expensive, since they are built to withstand multiple mine explosions. Conversely, the total cost of C-Turtle comes to about $70 (~£50) – that’s cheap enough to make it disposable. It is also more easily assembled, it doesn’t need to be remotely controlled, and it can learn to navigate new terrains. All this makes it perfect for clearing minefields. The researchers hope that robots similar to C-Turtle can used for space exploration. 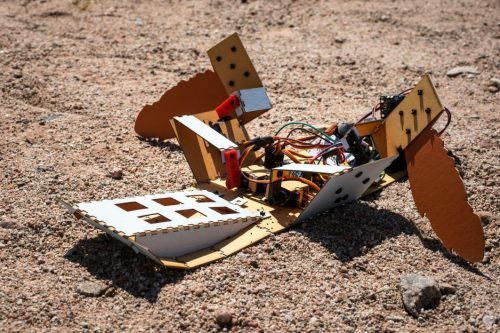 They found that the C-Turtle prototypes that had performed very well in the sandpits in their lab didn’t really do as well when they were released in actual desert conditions. By analogy, robots optimized for simulated planetary conditions might not actually perform well on-site. The ASU scientists imagine that C-Turtle materials and a laser cutter for the cardboard body could be carried on board a Mars mission. Then Martian C-Turtle design could be optimized after landing, and the robot could teach itself how best to navigate real Martian terrain. Congrats to Assistant Professors Heni Ben Amor and Daniel Aukes, and to the rest of the C-Turtle team, on their achievement! We at Pi Towers are proud that our little computer is part of this amazing project. * Check out our Turtley amazing resource to find out why! ** At a length of 7ft, leatherback sea turtles can weigh 1,500lb! *** That’s right: turtles survived the extinction of the dinosaurs! **** Is anyone else thinking of Great A’Tuin right now? Anyone? Just me? Oh well. Flipping awesome project – but are the turtles actually heavy enough to detonate the land mines? And was the learning software called Taught Us? Like David, I was wondering how the turtle actually clears the mines. Surely a bunch of cardboard (or even steel in that shape/size) with a RPi on it isn’t going to be heavy enough to detonate an anti-personnel mine. Now if you *did* make it with a large ferritic or martensitic steel skid in front, it might at least be enough to trigger anti-vehicle mines with magnetic detonators… but those that use magnetic/pressure combination detonators likely still wouldn’t go off. As regards mine clearing… At least one technique is to churn up the ground to bring the mines to the surface where they can be collected with detonating in place. As others have said, it takes a certain weight to detonate a land mine. Actually, it depends on the type of landmine. Yes, it does indeed take a certain weight to trigger an anti-tank mine – however, the triggers on anti-personnel mines (which are the ones which by their very nature pose the greatest threat to humans) can be extremely sensitive and be triggered by a light touch or nearby motion. Yepp, we never intended to have the robot intentionally blowing up landmines but to detect them. Our point was more that _if_ a robot gets blown up, it will not cost you much. Also you can have a fleet of those – and in the end you do not want to enter a minefield when your costly robot is damaged and cannot move anymore. I would not describe myself as an expert of landmines (from robotics to landmines is quite a stretch ;) ) but there seems to be a high possibility that landmines can explode by slight vibrations when they start to corrode and lie in the field for years. Having a map where landmines are in an area is actually quite crucial – but usually people laying landmines do not create landmines and even if: if your landmine is in a sandy area they change their position over time due to the movement of the sand. AndrewS is right about, that the ‘robot lets mines explode’-part developed somehow from the original story, but in Science you always have this certain fuzziness when media covers your research – however, this does not automatically invalidate the research behind the story. You always lose a bit control when you present your research to the public and in this specific case it seems that the idea to let landmines explode appears naturally in the head of people when you tell them ‘this robot helps to remove landmines’ although it was more meant to be ‘we can detect them and tell you where they are, such that you, the human who clears the landmine or the big expensive robot are safe and don’t get destroyed/explode’. Thank you for weighing in, Kevin! It’s great to have someone who’s actually worked on the project speak about its potential applications and how feasible they are. As a former researcher, I’m very aware of the “telephone game” effect you mention, so I’m pleased to hear that you think I managed to paint a realistic picture of your research. No Janina, you are not alone! I can even visualise the spirit of sir Terry astride his/her neck. There are more than 4 million mines in Cambodia. Expensive proposition. They are using rats to sniff out the mines now. As a concept, maybe. For practical mine clearing, i don’t think so. The more interesting thing i think on this project is the learning ability of the system. I guess it’s simple for this system, but could maybe extend to 20 servo’s or so, allowing a complicated robot to learn the best way to move or do another job.